Even though we have decided to travel in a 41 foot trailer – school must go on, so here is a fun gross Halloween experiment. Halloween is filled with candy, costumes and, of course, pumpkins. I came up with a gross Halloween experiment that was so gross the hubby forbade me to do another one like it ever again unless I am going to throw everything away myself. So enjoy this one, because there will not be another rotting experiment for a while! We are going to take six pumpkins, carve them to look like fun Jack-o-Lanterns, and then add various preservatives to each that we think will help it not to rot. We started by cutting the top off and getting the “guts” out, then carving each one of the pumpkins. I used a permanent black marker to draw eyes, nose and mouth and let the girls do their thing. It actually took us three days because we only did two a day, and we used some of the pumpkins on other experiments (double duty to deal with dollars). After carving the first two pumpkins we soaked them in bleach and borax. bleach solution: We didn’t use measuring tools, just basically poured enough bleach to cover the bottom, then add a little water mix it up, add the pumpkin and then add enough water to make sure the pumpkin is submerged. We learned in our sink or float experiment that the pumpkin will float, so turn it upside down and make sure to add the lid. Let it soak eight hours or overnight. borax solution: Basically the same as above but add enough borax (find in the laundry aisle) to cover bottom, add water to mix, add pumpkin, turn upside down, then enough water to cover, don’t forget top, and also let this soak eight hours or overnight. glue: After carving pumpkin, spray the whole pumpkin with Elmer’s spray glue, making sure you get inside and cut exposed edges really well. sea salt: (Or you can use any salt) We bought ours at the dollar store. Be sure to put on gloves and rub salt into the inside of the pumpkin and get the edges really well. hand sanitizer: We also got this at the dollar store. Follow same procedure as above, put on gloves and rub into the inside and all the cut grooves. This was the gross part. I tried to take lots of pictures and so did the girls. In just a couple of days the pumpkins began to get black mold, collapse and even melt, and there were tons of bugs – GROSS! Our hypothesis that treated pumpkins would last longer was not supported by our investigation Nothing we used helped to preserve a pumpkin from rotting, especially when it is 80-90 degrees like it was deep in the south. Maybe you are farther north you would have better luck. Our recommendation based on this experiment: Buy your pumpkins a week before Halloween and hope that it’s really cold. If you do decide to try this experiment expect lots of bugs: YUCK! Good luck! Regarding the ‘nothing’ pumpkin (the one we didn’t treat with any preservative): This one basically turned to liquid in about a week. The girls think that the metal pans help reflect the heat so basically they were cooking in sun. Will a pumpkin sink or float? Can a pumpkin be grown without a traditional pot? Which pumpkin will have the most seeds? 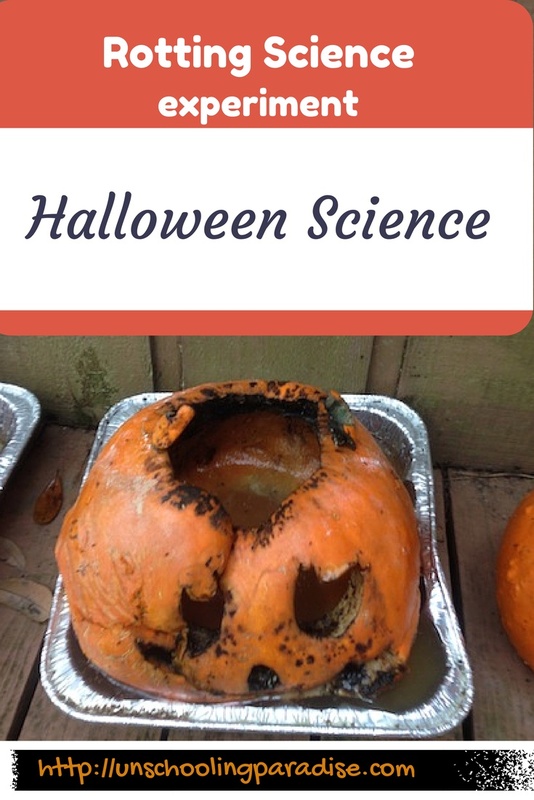 This entry was posted in Halloween science, Unschooling and tagged gross experiment, Halloween, jack-o-latern, rotting, science by Chrissie. Bookmark the permalink.